Regular cleanings help keep gums healthy and teeth cavity-free. A dental cleaning includes removal of tartar and plaque. The teeth are then polished to remove stains and further buildups of plaque that are not removed when regular tooth brushing is performed. Our office offers flavors that your child can choose. This allows your child to participate in his/her oral care, while making it a little more fun! Sealants protect your child’s teeth from decay. Sealants are placed on the biting surfaces of premolars and molars to seal the grooves and pits of the teeth. The teeth are prepped for the sealant application and the sealant is painted directly on the chewing surface of the teeth and then hardens. Generally sealants are applied without the use of anesthetic and are applied in one visit. They are applied by the dentist or the hygienist. An oral evaluation is recommended every six (6) months to prevent cavities and other dental problems. During an oral evaluation a thorough examination is done to check the hard and soft tissues of the mouth. Some children with a history of cavities or teenagers in orthodontic treatment may require more frequent exams and cleanings. Dr. Wagshall or your hygienist may recommend a personalized follow-up protocol based on your child’s needs. Dental X-rays are a valuable diagnostic tool used to identify decay, extra teeth, bone defects, tumors, cysts and check the progress of previous procedures. Latest technology now allow for digital X-rays, which reduce radiation exposure more than 50 percent, and produce instant, high-quality images that can be viewed immediately by the dentist and the patient. Bitewing Xrays and periappical Xrays are “close up” Xrays to help determine cavities and or infection. A panorex Xray helps us understand a more broad viisualization of your childs oral facial and dental development. It is mostly used in cases of trauma or infection. Tooth-colored fillings are the most lifelike material used to fill cavities. Once the decay is removed from the tooth, the dentist will apply composite material and harden it with a special “blue light”. These fillings are exceptionally strong and overtime have proven to be extremely effective. A dental crown is a restoration that covers or caps a tooth, restoring it to its normal size and shape. Crowns are necessary when the tooth is broken down to the point where a filling won’t be effective. In order to effectively place a crown, tooth structure may be taken away to help create an esthetically pleasing fit. Very often children crowns are made out of stainless steal and are all silver. In special situations we may be able to place a silver cap with a white veneer to improve esthetics. Ask the dentist if this treatment is available for your child. Lasers in dentistry allow for many dental procedures to be performed with no noise, very little pain and fewer appointments. Some minor soft tissue procedures our office performs: removing excess gingeval tissue, exposing unerupted teeth, or treatment of athous ulcers(canker sores). Whitening, also known as bleaching, is the procedure used to brighten teeth. In-Office Whitening usually requires only one office visit. A protective gel or a rubber shield is placed over the gums to protect the soft tissue. A bleaching agent containing carbamide peroxide is applied to the teeth, and a laser light is then used to enhance the action of the whitening agent . These appliances are used as an alternative to traditional braces and to help with functional problems such as spacing, crowding of the teeth, TMJ disorders, overbite, overjet and malocclusions. They are often used in pediatric dentistry to correct single tooth cross bites or for minor tooth movements. 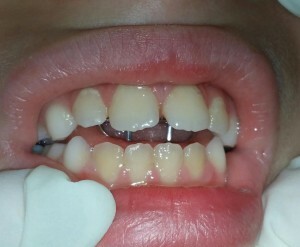 Space maintainers are used for children to keep a space open in mouth after a tooth has been lost. Often necessary when a child loses a primary tooth too early-usually due to trauma or decay-space maintainers can save the opening for the permanent tooth that will eventually erupt into that space. Otherwise, existing teeth may shift into the space or permanent tooth may move or turn so that it does not erupt correctly. Space maintainers can be used on the upper or lower arch and may be removable or fixed into position with cement to securely remain in place until the adult tooth is ready to erupt. Mouth guards are a customized device worn over the teeth to protect them from injury or to treat conditions such as bruxism (teeth grinding),snoring, or sleep apnea. They protect the teeth from chipped or broken teeth, nerve damage, lip injuries and tooth loss caused by these conditions. An effective mouth guard should be comfortable, durable, easy-to-clean and allow patients to breathe and speak normally. Depending on each patient’s individual needs, mouth guards may be worn only when speaking, while playing sports or at all times. Traditional metal braces offer affordability and an opportunity to personalize color. Clear Ceramic braces are popular with adults and teenagers who want the results of braces without the look of metal. Some teens prefer them to metal braces because of their invisability. Some children face challenges of special physical or emotional needs. Dr. Wagshall is specifically trained in the management of these patients and goes the extra mile to ensure their care. Extra time for treatment will be provided when needed. The doctor will coordinate your child’s dental treatment with your physician or surgeon to make sure their care is provided as safely as possible. Some children may require treatment under general anesthesia. Dr. Wagshall is an Attending at Maimonides Medical Center, where a child can have his or her treatment completed safely while anesthetized. Dr. Wagshall is an Attending at Maimonides Medical Center in Brooklyn, where he performs oral rehabilitation under general anesthesia in an operating room. By having a complete staff of pediatric dentistry, nursing, and anesthesiology , you can be assured that your child’s dental care is done in the safest way possible. Candidates for this procedure might include those with severe anxiety, special needs or those with extensive dental decay. We will discuss in detail the risks and benefits involved with general anesthesia before the procedure.